I received a few recipe requests for the roast chicken I posted on Instagram, possibly over a week ago. Unfortunately I am only getting around to posting the recipe now; hopefully my timing is not too late for Thanksgiving (for those of you who eat roast chicken rather than turkey). My family prefers chicken over turkey and I have no clue why as I don’t eat any meat at all. Below you will find a very simple recipe for delicious roast chicken. 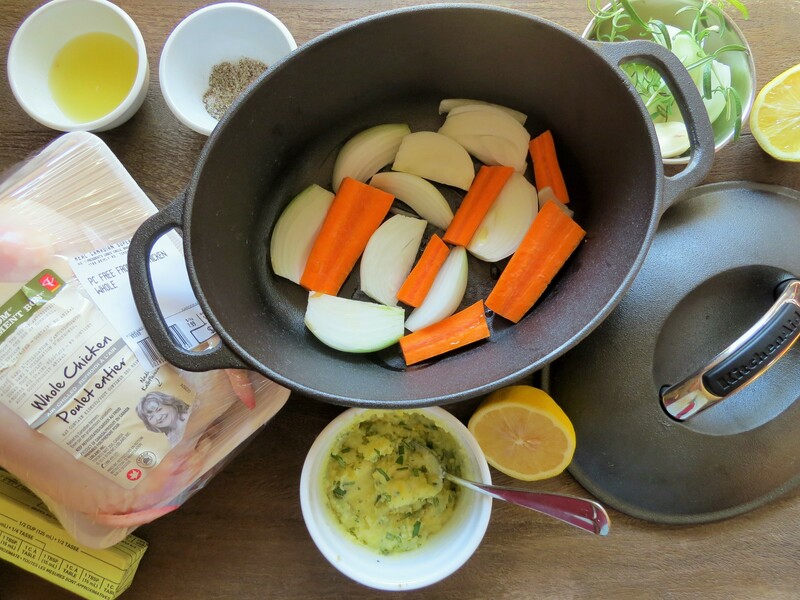 I almost always stick to the following recipe when roasting a whole chicken because the combination of ingredients yields a very tasty (according to my family) and aromatic roast that is moist and full of flavour. Melt the butter in the microwave. Add the chopped rosemary leaves, zest of one lemon, and grated garlic and give it a quick stir. Refrigerate the butter so that it hardens slightly. Preheat the oven to 450 degrees Fahrenheit. Prepare your roasting pan or dutch oven by placing the quartered onions (reserving two pieces), carrots, and celery at the bottom of the roasting pan. Check your chicken’s cavity to see whether the neck, giblets, and kidneys are inside of it. If so, remove it and set it aside for future use or discard. Wash the whole chicken in cold water, the outside as well as the cavity. Pat dry with paper towel. The reason for drying the chicken, is so that the chicken roasts, instead of steaming. This one small step will ensure crispy skin all around. Most chicken will already come trussed (legs tied so that the chicken cooks evenly and looks pretty). If the chicken isn’t trussed, truss it by tying the legs together with kitchen twine. Season the chicken, including the cavity, thoroughly with salt and pepper. Place the un-juiced half of the lemon, garlic clove, bay leaf, rosemary sprigs, and half an onion inside the cavity. Slather on the herbed butter all over the chicken, including the underside, and wings. Make sure to use all of the butter. Place the chicken in your roasting pan, atop of the onions, carrots, and celery and then pour the juice of half a lemon on top of the chicken. Place the chicken in the pre-heated oven. Let it roast for 15min. After the 15min is up, turn down the oven to 375 degrees Fahrenheit and continue roasting the chicken for twenty minutes per pound. For example, if your chicken is 4 lbs, you will have to roast for at least 1 and a half hours. A meat thermometer may also be used. In that case roast the chicken until it reaches an internal temperature of 165 degrees Fahrenheit. The thermometer must be inserted into the thickest part of the breast, but not touch bone to ensure a proper reading. 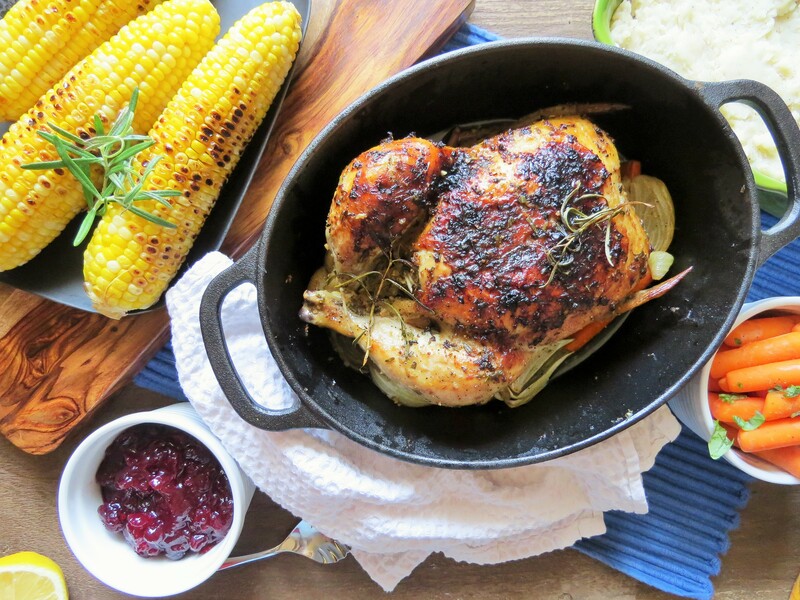 Every 20 minutes, baste the chicken with the pan drippings using a turkey baster, spoon, or brush. This will help the chicken stay moist and keep the skin from burning. 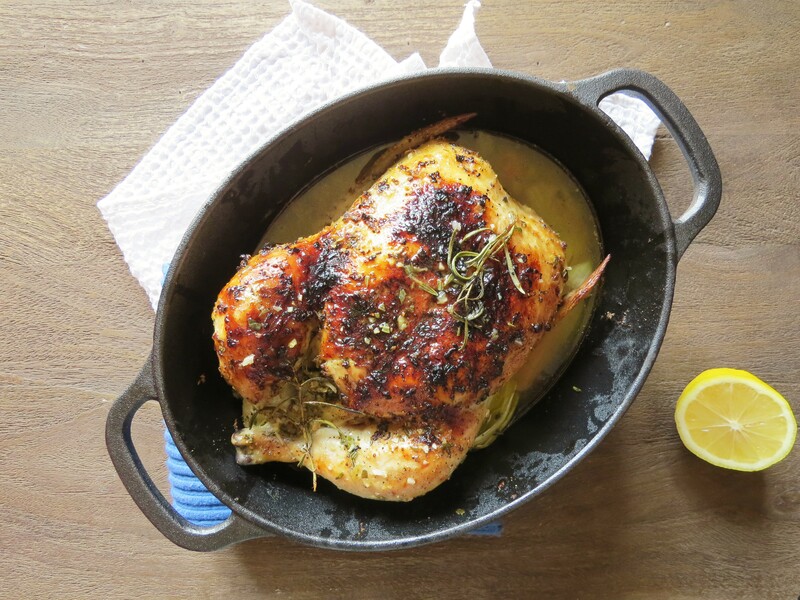 It is best to roast without the lid, as it results in a more crispy and evenly browned chicken. 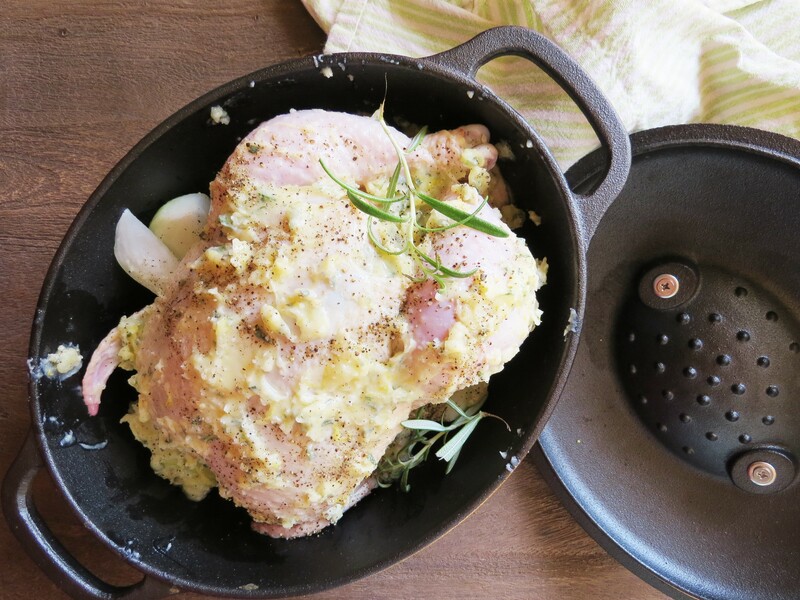 However, if you notice that the chicken is turning too brown for your liking, place the cover on your roasting pan or Dutch oven, but leave it slightly ajar to prevent the chicken from steaming rather than roasting. You may also use aluminum foil. After the roasting process is complete and you have taken your roast out of the oven, let your chicken rest for twenty minutes. If you cut into it too quickly, the juices will flow out, resulting in dry meat. Letting the roast chicken rest gives it the opportunity to redistribute its juices. Before cooking and handling raw meat, make your sure your hands and countertops are thoroughly clean to avoid cross-contamination. Take the necessary precautionary methods to store and prepare raw meat, to ensure that the juices of raw meat do not contaminate other foods. If you want to avoid eating the skin, remove the skin after cooking. The skin will help the meat stay moist and tender. For a healthier alternative, try substituting olive oil for the butter. 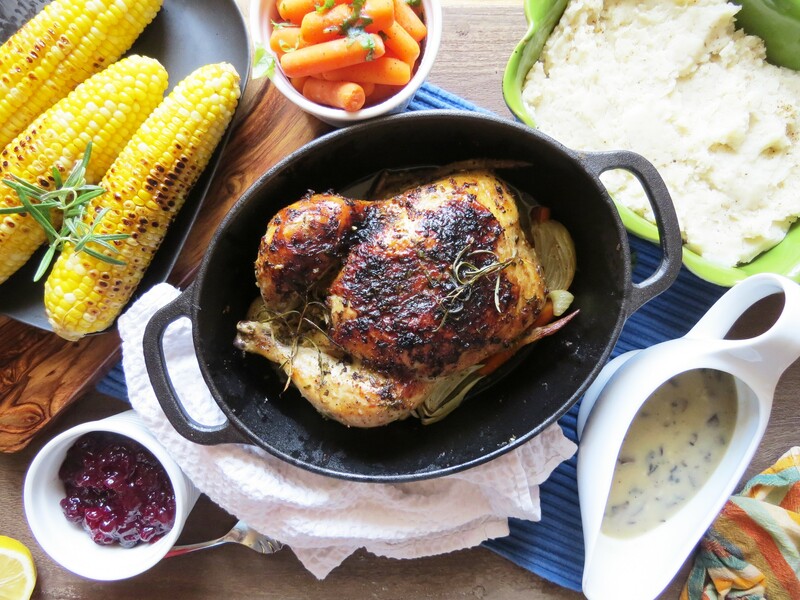 You can serve the roast chicken with any number of your favourite sides: mashed potatoes, roasted potatoes or vegetables, corn on the cob, steamed vegetables, gravy, and cranberry sauce. Leftover meat can be used to make soup, pasta, or chicken salad. Bones may be saved to make bone broth. Check how to make broth HERE. If you notice in my pictures, my roast is slightly charred on top and this is just a family preference. I set my oven to broil at the end of cooking, and broil the chicken for an additional three minutes. If you aren’t already following me on Instagram, you can do so HERE. 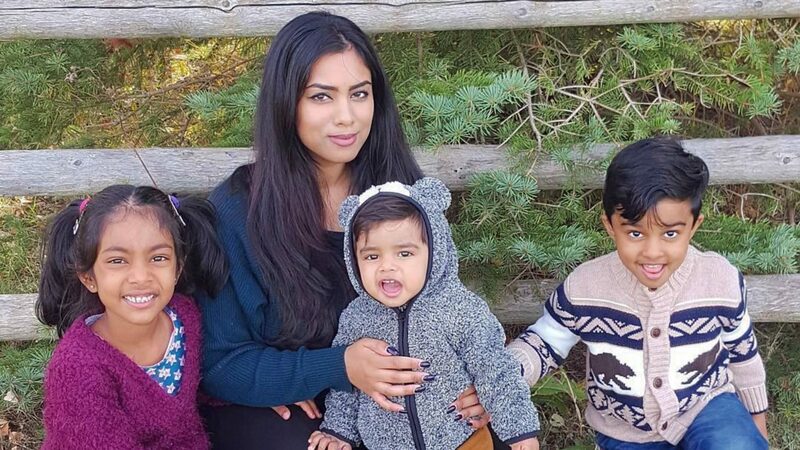 Happy Thanksgiving to all my fellow Canadians, celebrating this weekend!